Anyone who has ever watched an episode of Game of Thrones or read A Song of Ice and Fire knows there is a lot going on. The characters have unique stories and the events are larger than life, so it's easy to miss tiny details from time to time. Well, recently, an eagle-eyed fan of the series picked up on a few small details and made some connections for us that are pretty mind-blowing if you ask me. In a Reddit thread, user thegeocash shared his or her insight about the connection between Martin's series and the DCEU. Martin is a known comic book lover; it was revealed when he talked about the fan letter that he wrote to Marvel comics in the 1960s, so it's no major stretch these subtle nods exist in his series' universe. The thread specifically points out Martin's use of "blue beetle and green arrow" as the sigils of the Houses of Sarsfield and Bettley and sees them as direct references to Ted Kord and Oliver Queen of the Justice League. Both Blue Beetle (the name encompassing several superheroes including Dan Garrett, Ted Kord, and Jaime Reyes) and Green Arrow (Oliver Queen) have appeared in recent adaptations of DCEU comics including Smallville and Arrow. One could take this user's clever recognition even further and say that the "black hood" referenced in the same breath above is a nod to Gotham's most famous vigilante, Batman. In fact, Martin has subtly referenced Batman often in his series. Looking specifically at the image below, you will notice the symbol of a black bat on a field of yellow. Look familiar? Yea... I thought so, too. If you're still not convinced, think about the House Leygood sigil, which features three lightning bolts over an orange background. Again, not a 100 percent match, but still awfully resemblant of The Flash's famous yellow lightning bolt. 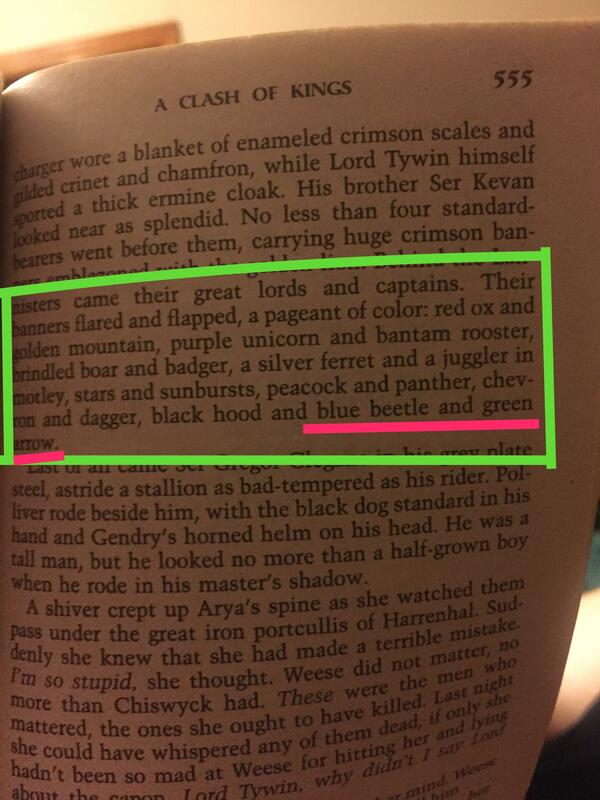 Clearly, there are plenty of small details like these to be uncovered, and since the new season premieres in two weeks, now is as good a time as any to start rereading the novels and rewatching the series.